We spent half a year in Thailand. In particular, we lived in Chiang Mai and visited some places around the country despite busy work schedule. Here are some Thailand Travel Resources that helped us to enjoy the Land of Smiles. Admittedly, this is not a travel guide, and there are no tourist attractions here, but a collection of helpful links (collectively called Thailand Travel Resources) that you may find useful while staying and traveling through the country. Initially focused on Chiang Mai, the capital of Northern Thailand, we expanded and updated our Thailand Travel Resources to include the southern part of the country. 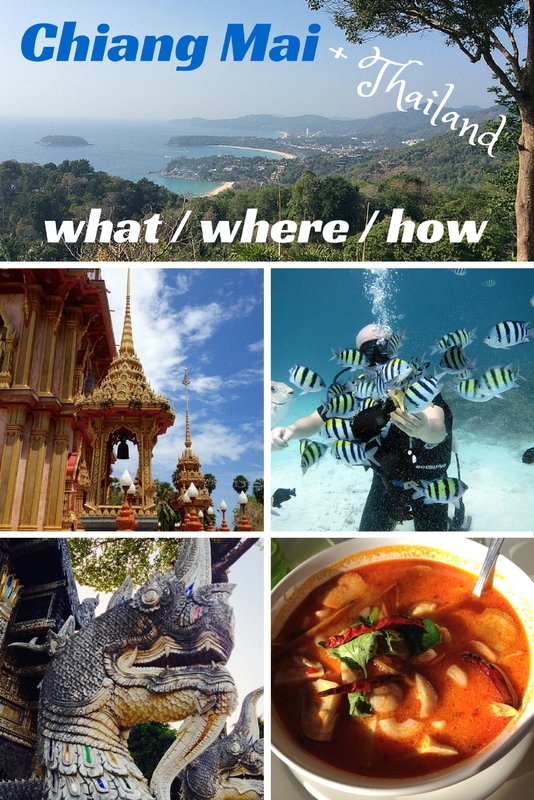 Surely, we continuously keep a keen eye on finding and adding new information to our Thailand Travel Resources. Every trip begins with research. That’s where our worldwide Travel Resources shine. Sorted out what you must do before leaving? Travel Planning is next. Moving to Thailand with Pets – for informational purposes only; we haven’t used them and this is not an endorsement. TheThailandLife.com – started as an outlet to share personal experiences with folks back home, but ultimately grew into a vast collection of resources for those who plan living/traveling in Thailand. The Break Room by CMDN FB group – where to stay in CM, bike rentals, social scene, food, sports, visas etc. Taxi-Meter Chiang Mai – from personal experience: excellent service, on-time (even at 4:00 in the morning when I needed a ride to the airport). At the same time, with Grab coming to Chiang Mai, you may think twice (and go with Grab) before using this service. Cat Motors (formerly Chiang Mai Scooter Rental)- or check them on Facebook or read reviews on TripAdvisor. We spent half a year in Northern Thailand. We lived in Chiang Mai and visited different places near and far. Here are some online travel resources that we used to make our life more enjoyable in this beautiful country. That’s a solid list. Good job! I use many of the listings for years now! Perhaps you could have a look at https://www.toptravelfoods.com. This website and app recommends travelers the best local food in their area. Thailand has so much more to offer than only Pad Thai and Fried Rice. The app is perfect for people who have not much knowledge about the Thai cuisine and DO want to try local food, as it is part of exploring the local culture. Thanks for heads up – Cat Motors had been added to the list :). Actually, I remember walking by your shop back when it was still called Scooter Rentals. Cheers! This article gonna become the only Thailand travel resource you need :)))) good work Elena! I love your guide on Chiang Mai, lived there for several months and I know how handy it is to have something like this when accustoming to a new destination. Hello, Remmy. Unfortunately, I can not help you with any contact information. I would suggest checking Thai Visa website. It is a very active community and they might be able to help you. Hi, Kevin. Apparently, you were getting this message ( “The page you requested cannot be displayed right now…” ) because I ♥ Chiang May used to be a secret group. Do not ask me why the group admins felt that it should be secret in the first place. Facebook do not show secret groups to non-members, but instead, display the message that page does not exist. As of today, Dec 17th, the group’s status has changed to closed. From now on, if you follow the link you should see the group and can request to become a member. Thank you. Hope you are enjoying Chiang Mai! Talk about a taste of home. We lived in Chiang Mai Riverside condo for like 8 months all together. We’d walk all the way down Chiang Mai Lamphun Road to get our cardio, then we’d pick up some of our fave treats, then, off to the condo again. Awesome cardio, awesome selection, and the Ping River view was pretty too. We love CM; may be our fave city on earth for its mix of Thai culture, creature comforts and dirt cheap cost of living. We feel its the ultimate travel spot for so many reasons, especially where we stay, which has a strong Thai feel to the neighborhood. Thanks Elena for the awesome share! Great to hear from you, Ryan. Time flies; hard to believe it’s been years since first publishing. Happy travels!